Hoshizaki America, Inc. was awarded the U.S. Environmental Protection Agency’s ENERGY STAR Partner of the Year–Sustained Excellence Award in 2015. 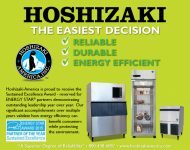 Peachtree City, GA, April 6, 2015 – The U.S. Environmental Protection Agency (EPA) has recognized Hoshizaki America, Inc. with a 2015 ENERGY STAR Partner of the Year – Sustained Excellence Award for their continued leadership in protecting our environment through superior energy efficiency achievements. 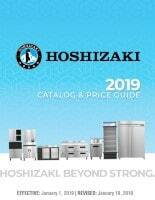 Hoshizaki’s accomplishments will be recognized in Washington, D.C. on April 20, 2015. 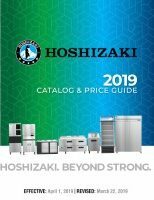 Hoshizaki America, Inc., an ENERGY STAR partner since 2003, will be honored for its long-term commitment to energy efficiency. Increasing sales of ENERGY STAR certified products by 100 percent. Partnering with EPA to deliver two dealer training sessions. Training more than 12,000 dealers and 90 percent of existing employees on ENERGY STAR certified products and their benefits. Integrating ENERGY STAR messaging using many different media—tradeshows, print, mail, point of purchase—and achieving over 500,000 impressions. Being a national leader on partnerships with the energy efficiency community, including full participation in the ENERGY STAR Retail Action Council, with the goal of increasing partnerships with energy efficiency program sponsors. Featuring ENERGY STAR in three national TV and eight national radio ads for lighting and appliances. Integrating ENERGY STAR into its print circular advertising, including 99 national print advertisements and 290 regional print advertisements. Combined, these efforts resulted in billions of consumer impressions. Being a leading participant in the ENERGY STAR LED Bulb Challenge and selling millions of certified light-emitting diode (LED) bulbs in 2014 alone. The Home Depot worked with its suppliers to offer low cost ENERGY STAR certified bulbs to its customers, and worked to educate them on the value of ENERGY STAR lighting by displaying and distributing ENERGY STAR print materials in all stores. 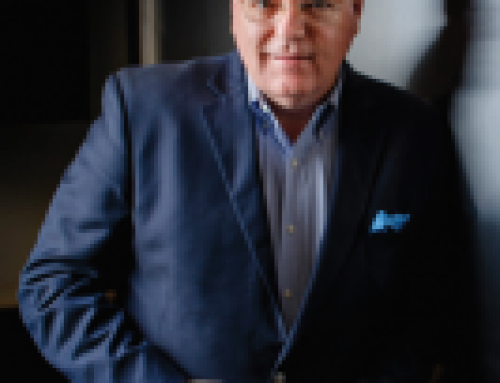 Leveraging a three-phase strategy working with suppliers, advertising, and consumers to grow the company’s in-store ENERGY STAR assortment, adding 840 additional products and increasing ENERGY STAR sales by over 10 million units. Working with local utilities in 44 states to coordinate rebate offerings for ENERGY STAR products, resulting in approximately $300 million in incentives for customers. This included offering instant rebates for ENERGY STAR LED lighting products in 900 stores and consumer rebates of over $45 million. Educating all employees about the value of ENERGY STAR certified products through a variety of training programs from eLearning to Rapid Web Based Training, to Monthly Merchant Updates and Home Depot Television. Total impressions from these training vehicles were more than 197 million. Using ENERGY STAR Portfolio Manager® to benchmark and track the energy performance of more than 1,800 facilities, accounting for more than nine percent of its client portfolio. Helping more than 160 client buildings earn ENERGY STAR certification in 2014. Leveraging ENERGY STAR Portfolio Manager web services to calculate and display ENERGY STAR scores on Burton’s Energy Portal dashboard for clients. Embedding the 2014 ENERGY STAR Partner of the Year logo in the email signature of every Burton employee, resulting in more than 320,000 impressions in 2014. Drawing on ENERGY STAR Bring Your Green to Work materials to engage employees in energy conservation and efficiency. Benchmarking 100 percent of its client buildings in ENERGY STAR Portfolio Manager®. Assisting more than 90 client buildings in earning ENERGY STAR certification. Promoting ENERGY STAR tools and resources at multiple conferences to building owners and operators. Putting together five teams, comprised of more than 50 individual buildings, to compete in the 2014 EPA ENERGY STAR National Building Competition. Achieving a 10-point increase in the 1–100 ENERGY STAR scores of 25 client buildings since the baseline year of 2009. Adding more than 840 new ENERGY STAR certified products (raising its total to nearly 4,000), including those with its innovative WaveStream™ light-emitting diode (LED) technology. Training more than 11,000 retailer and distributor employees on ENERGY STAR through a variety of vehicles, including the Cooper Lighting SOURCE training facility, email, newsletters, online videos, and in-store events. Partnering with Georgia Power to develop an educational lighting exhibit in their Atlanta headquarters, including an interactive LED exhibit which educates and demonstrates to consumers the benefits of ENERGY STAR certified products. Collaborating with EPA for the debut of the ENERGY STAR LED lighting Facebook tab by featuring select products to help consumers learn about and experience the benefits of ENERGY STAR certified LED lighting in a new and engaging way. Partnering with retailers and residential builders to educate associates on the benefits of ENERGY STAR certified lighting products through strategic implementation of its innovative Halo Hut educational kiosk.